This silver wagon has an automatic transmission and is powered by a 2.0L H4 16V GDI DOHC engine. With that frugal motor it gets 8.8 L/100 km in the city and uses just 7.2 L/100 km out on the highway according to Transport Canada. Our Crosstrek's trim level is Touring CVT. 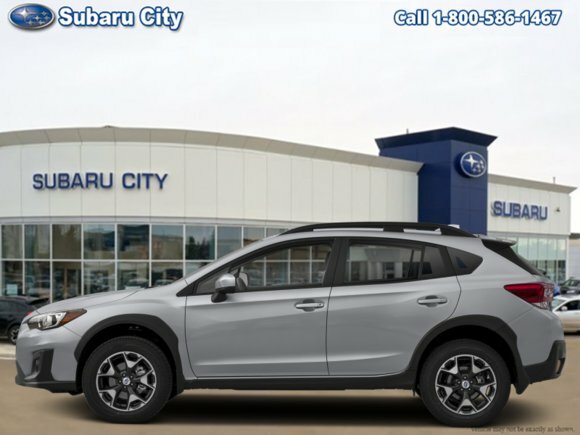 This Touring Crosstrek comes equipped with fog lights, automatic headlights, automatic climate control and a leather appointed interior with a leather wrapped steering wheel and heated seats. This crossover also comes with a 6.5 inch infotainment system with Apple CarPlay, Android Auto, STARLINK smartphone integration (including Aha radio), USB port/iPod control, and steering wheel audio controls. You'll also get aluminum alloy wheels, and a rear view camera to help get into those crowded trail heads. This vehicle has been upgraded with the following features: Heated Seats, Rear View Camera, Aluminum Wheels, Keyless Entry, Starlink, Bluetooth, Steering Wheel Audio Control. Want to try the 2019 Subaru Crosstrek Touring CVT?